I remember that game like it was yesterday. Midweek highlights were pretty rare then. With no internet etc, all you had to do was avoid the news for a score and I recall that the game was on Sportsnight on BBC. 2 days later (I think), Kenny is gone. Was the beginning of the end then. Molby, Brucie, Stevie Nicol all getting on. Hard to believe it is over 25 years ago. Book just out by Richard T Kelly called Keegan and Dalglish. Looks good. Mentions how he first met the King in the old Jurys in Ballsbridge before a pre-season friendly in 1980. Said loads of kids camped out in the foyer trying to get players autographs. Remember this well as camped out many times to meet the players in Jurys over the years. RedArmagh, honald_tdb, south and 3 others like this. Is that in cinemas or LFC TV? It's nothing to do with LFC tv. I would say very limited cinema release and straight to television. It was also the reason why King Kenny was in the Kop last April for the 1st half of the Bournemouth match. Out on dvd November 20th. honald_tdb and GaryMc like this. That's the Christmas pressie sorted now!! He was my hero then, he still is now. Have to say that I totally agree. An immense influence on my love of Liverpool FC. Liverpool great Kenny Dalglish thought he was being sacked for a second time when he was called into manager Jurgen Klopp's office for a conference call with owner John Henry - only to discover he was being immortalised at Anfield. 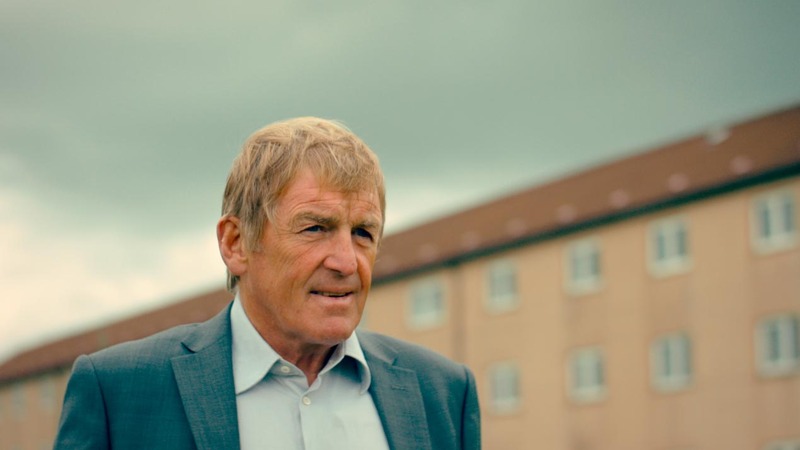 The 66-year-old Scot will attend a ceremony on Friday where the former Centenary Stand will be renamed the Kenny Dalglish Stand in his honour. Family, former team-mates and also rivals - including Manchester United's Alex Ferguson and Bobby Charlton - will be present to see the man still regarded as the best player in the club's history recognised. It will be a slightly different feeling for Dalglish, a non-executive director with an ambassadorial role, than the day late last season when he was called to the club's Melwood training ground. "Mike Gordon (Fennway Sports Group president - and the man who sacked Brendan Rodgers) was over and he asked to see me at Melwood," said Dalglish, who was sacked in his second spell as manager in 2012 after leading Liverpool to victory in the League Cup, an FA Cup final and eighth place in the Premier League. "I went up to Jurgen's office and there was a laptop there and John (FSG's principal owner) and Linda (his wife) were on it and there was another one with Tom Werner (Liverpool chairman) on it. "John started speaking and I thought, 'Jesus what have I done now?' I thought I was getting the sack again. "I thought I was in trouble and then he said they wanted to name the stand after myself, as well as for the football it was for the work done with the community with Marina (Dalglish's wife) and the charity and everything." The unveiling will come less than 24 hours before the arrival of arch-rivals Manchester United for the resumption of the Premier League and Ferguson and Charlton are both on Dalglish's guest list for the event. Despite the public perception being of a frosty relationship between the two Scots when they were in charge of England's two most successful clubs in the 1980s and 1990s the former Reds boss insists the pair are friends and always have been - despite Ferguson succeeding in his quest to "knock Liverpool off their perch". "If he wanted to get to the top he had to target Liverpool, and Everton, because when he came down here in the 80s Liverpool and Everton were winning at least one thing every year," added Dalglish. "I don't even remember him saying that comment. It wouldn't have registered with me. "How can you criticise someone who is totally supportive of his club? He made a massive contribution to Manchester United. "Away from working there has never been a problem with him. After the end of the game there was never any animosity or dissent from either of us, there would always be a drink. "His actions speak louder than a 1,000 words, him and Sir Bobby coming over. They did exactly the same after Hillsborough. They were over here early doors. "There is rivalry on and off the pitch but when it comes to something like that there is not even a doubt about it - they will be over here supporting us and hopefully we would do the same for them." Joedared and redabbey like this. I'll forgive him, as he's Scottish, about Fergie but when I read that earlier I nearly died laughing how humble the guy is, thinking he was being sacked again. I can't understate the positive effect King Kenny has had on my life. He's inspirational. redabbey and honald_tdb like this. mushypea, GaryMc and honald_tdb like this. The Pernicious One would be delighted to know if and when this will be displayed on the Silver Screen in the Republican Ireland! Showing in Belfast Queens University Theatre but can't find anything for Dublin. The moving story of a unique relationship between a man and a city: Kenny Dalglish, or The King as he is known by the fans of Liverpool FC. As a player and manager of the club he won thirty trophies but arguably his greatest challenge came in the aftermath of Hillsborough when he became a beacon of hope and strength for the families who suffered tragic losses and in the twenty-seven-year fight for justice that followed. This feature film documents his early life in Glasgow, how he met his wife-to-be Marina, his meteoric rise at Celtic and the triumphs that followed during his glorious playing days at Liverpool FC. In 1985, just a day after the Heysel Stadium tragedy, Kenny was appointed player manager of Liverpool FC. Already idolised for his ability on the pitch, this intensely private 34-year old was now the public face of the club, making the leap from player to ‘gaffer’ at the most difficult of times with 39 deaths at Heysel hanging over the club and the city. His managerial success during the years that followed are uniquely captured through the eyes of legendary former players such as Alan Hansen, Ian Rush, and John Barnes as well as one of his greatest rivals Sir Alex Ferguson. But there was more tragedy to come and all the triumphs were overshadowed by 96 deaths on the terraces of Hillsborough. The impact of that terrible day is vividly portrayed by Kenny, his family and his closest friends with the weight of supporting the families who lost their loved ones and sharing the grief of an entire city eventually leading to his resignation as manager. Uplifting, funny, powerful and at times truly heart-breaking, this unique portrait of a proud and caring man will touch the hearts of everyone who sees it. Featuring his greatest moments on the pitch, previously unseen footage of Kenny relaxing at home with his growing family and in-depth interviews with him and all those that know him best, this film tells the story of one of football’s greatest players and a city’s favourite adopted son.